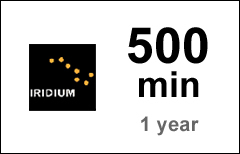 The Global 500-min airtime voucher refills your existing Iridium Global account. This voucher can't be used to load Emergency, regional and not-reloadable prepaid accounts. Returns and Cancellations. You can request a cancellation only if your voucher has not yet been loaded to your Iridium account. Prepaid vouchers that have been loaded to a prepaid account are NOT returnable or refundable, no exceptions! Maximum Age Limit. The Maximum Age Limit of the minutes in this Global 500-min voucher is 3 years.